This is one of the best westerns I've read, and I've read more than my share. Ms. Adams picks you up and plops you down in the middle of the old west complete with lingo, trail dust, ornery cowboys, and of course, the hunky hero and beautiful heroine. Though this love story is intense and real, it doesn't overshadow the western quality of the story. Men as well as women will enjoy it. The author paints the characters as vivid individuals—some you'll want to smack, others you'll want to shoot, and a few you'll want to hug. The plot is thorough with lots of twists and turns. I highly recommend this story, it's one you'll not want to miss. In this anthology, you will read stories that will make you smile, chuckle, and laugh right out loud. Jacquie Rogers writes a trademark tale, one that we have come to identify with her. A great romp of fun and hilarity until feisty Becky Lynch finally snares her man--good hearted Dex Madsen. Kirsten Lynn's story is very clever and well-written. Who would think of a Race for a Bride but Kirsten? When Cal Renner encounters this brave and wily woman, he can't resist helping her. Tracy Garrett uses her wonderful talent of writing romance and manages to get a groom for spinster Martha Bittner. She's waited four years to snag Sheriff Matthew Tate, and now she's not waiting anymore. Wait until you see what she does. Kristy McCaffrey pairs a determined woman with a more determined U.S. Marshal in this fun read. From the first page to the last, you'll wonder who is the mysterious figure who whispers in Annabel's ear--and why. Linda Hubalek has a heroine who has just bought an abandoned homestead. But the ex-owner shows up for his own reasons to reclaim it. When push comes to shove, the citizens of the town step in to help the couple move along to their happily ever after. Kathleen Rice Adams--who but this writer could think of this plot. 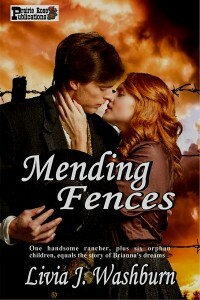 I promise, you will love the worst outlaw in the west when he encounters a spinster who is desperate to save her bank. Man, does she have ideas! Author Livia J. Washburn's prose is engaging, seemingly flowing onto the page with an un-self-conscious strength that lulls readers into the tale like a river might carry a raft. There is comfort in that kind of book: Readers disappear into another time and place, into someone else's life, with never a worry rapids lurk just around the next bend. That is not to say there's no excitement in the story -- plenty of excitement adorns the pages. What readers won't find is the type of over-the-top depictions of love and romance they might expect in a romance novel. Emotions ring true for both main characters without ever seeming overwrought. Men who read westerns but eschew romance novels probably will enjoy this one. Romance writers and western novelists alike will identify with Brianna, who is excruciatingly conscious of the flowery language and outlandish storylines upon which her successful career is based. The juxtaposition of Brianna's style with Reasoner's only emphasizes the effortless relationship Reasoner apparently has with words. Amusingly, not until the Big Love Scene at the very end does the story succumb to a few tricks of the romance-writing trade. The sense of time and place in Mending Fences is extraordinary. Details are engrossing but not overwhelming, and they're never academic. For humor, adventure, family drama, and the pure joy of an effortless read, I highly recommend the book. 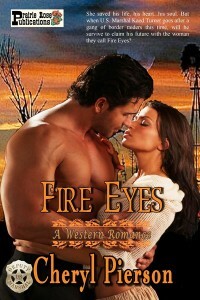 Fire Eyes is a wonderful story full of characters you'll love and those you'll hate. Jessica and Kaed's destined love for each other will warm your heart, making you wish for a happily-ever-after for them. Fallon and his Brigade are vicious in every respect and you can't help but hope they get what they deserve. I found the secondary story with Lilly and Tori heart wrenching as they cling to each other and pray that they can escape from Fallon's clutches. Kaed's fellow marshals were also a wonderful addition to the story, as the author portrays how their friendship and loyalty shape their lives. I have to say that Frank Hayes, who is young and still learning the ropes, is my favorite marshal. Ms. Pierson has created a soulful tale about love, loyalty and friendships that last a lifetime. For those who like a bit of the paranormal in their story, there's a touching moment that is sure to make you smile.